From the Introduction: copyright Charles S. Waxberg, no reprints without permission. You can tell very little about a stranger who's reading a book or a magazine. Perhaps you make general assumptions from the subject matter, but little else. However, if you see someone reading a playscript, you inevitably think they are in theatre or taking a dramatic literature course because very few people read plays for pleasure. There is a reason for this: plays are meant to be performed, not read. Until a script is married with the artistic contributions of actor, designer, technician, director, and finally audience, it is unfinished. A novel completes its circle with one reader as a painting does with one viewer. But the performing arts require collaborative contributions and for this reason, are intentionally incomplete. And since, as works of writing, they are incomplete, they are rarely read for pleasure by everyday people. The first contact an audience has with a play is the last stage of its development. They hear about it, see an advertisement, get an invitation, receive a recommendation from friends, or similar publicity. These are the final ingredients but the genesis of that play began in the mind of a playwright. An idea came from some unidentifiable place we call inspiration, and seeded the mind. All life begins with seeds, and plays are recreations of life on an artistic level. The play was born with that seeded idea, and evolved first into a script. Then the script was collaborated on by other artists, and grew to production. Every artistic choice, technical invention, and dramatic interpretation was created to bring that idea to life in the fullest, most communicative form possible. The script is the tangible life of that seed and everyone involved uses it as a reference just like everyone on a new building site refers to a blueprint. But what exactly is a script? The script is nothing less or more than a sequential listing of actions. Actions are anything done and the script lists these actions, in sequence, that will result in the completed work brought to life by all the artists involved. Although there may be descriptions of location and character, this is not crucial especially in 20th Century drama. A script is no more a play than a blueprint is a house, or a recipe is a cake. If it were a novel, he may have described in great detail the appearance and atmosphere of the pub--the stained glass windows, the dark oak tables, the presence of music and din, or the class and demeanor of the other patrons. But Pinter acknowledges that these details are design and directorial interpretations and the audience will see them. A playwright chooses as few words as possible to convey an idea. 2nd action: Jerry approaches with drinks. Then specifying more the nature of what he is carrying in order to illuminate character efficiently, a pint of bitter for him, a glass of wine for her. 8th action: looks at her. 9th action: (Jerry says,) "Well..."
Often, you will find a non-specific action Pause or Beat which means that the playwright is giving you a period of time before the next action begins. This is not an indication to "wait," but more of a "free space" to fill with the action that serves your character or your production best. So basically, a script is no different than a good recipe. (Or for that matter, a bad script, a bad recipe.) Take eggs, flour, water, yeast, and sugar (the ingredients), mix, let it rise, do this, do that (the actions), and you get bread. Take a 16th century Danish castle, a prince, his uncle/stepfather, a ghost, a girlfriend, some buddies etc. (the ingredients), do this, say that, kill them (the actions), and you get Hamlet. It is no less or more a sequential listing of actions and ingredients than a blueprint, a dress-pattern, a computer program, DNA, travel directions, dance steps, or any instruction manual. The more complex the item or process explained in the instruction manual, the more complex the instruction manual must be. The more complex the instruction manual, the more difficult it is to understand. Plays are about the human condition. They use human behavior to demonstrate a unique view of this human condition. And there is arguably nothing more complex than our species and its societies. A play attempts to present one facet--one illuminating insight--of the world in which people live and have lived. And to recreate life, even one facet of it, is an extremely intricate and subtle task. The script is the instructions--the artist's DNA--to recreate this life, and cannot merely be read like a book. It must be studied. It's actions are deliberately unspecific. Exactly how does Emma ask, "how are you?" How long does she sit before Jerry enters? What are they doing during the "Pause?" Even with the elaborate descriptions of Shaw or the specific stage-directions of Arthur Miller, the latitude--and necessity--for interpretation is enormous. The more actors knows about all scriptual elements, the better their choices. The actor who understands play structure will be able to build the most powerful climax and create thematic completion. The actor who understands psychological motivation will best create believable, stirring characters. The actor who understands the playwright's process will best be able to fulfill it's ideas and inherent theatricality. The more versed actors are in reading scripts, the more adroit they will be at making strong, powerful choices that illuminate the play and entrance an audience. 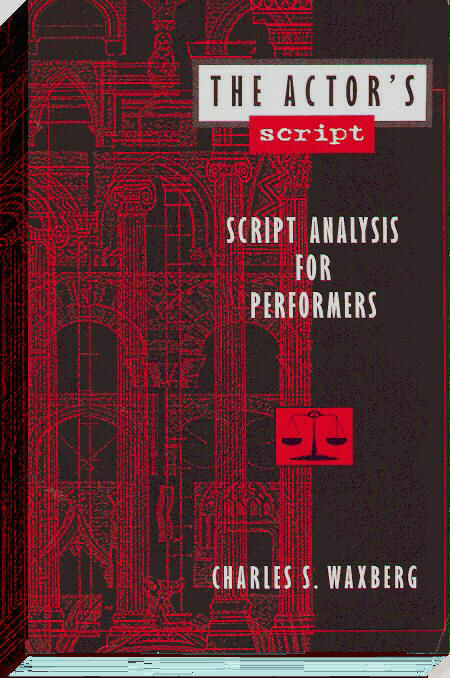 This book examines the most universal elements in scripts so that actors can intelligently interpret and use them. When you finish reading here, you will be able to pick up any script and pull the most useful elements, enliven the largest statements, and recognize the playwright's subtle signposts that point the way to strong theatrical conflict and rich performance.